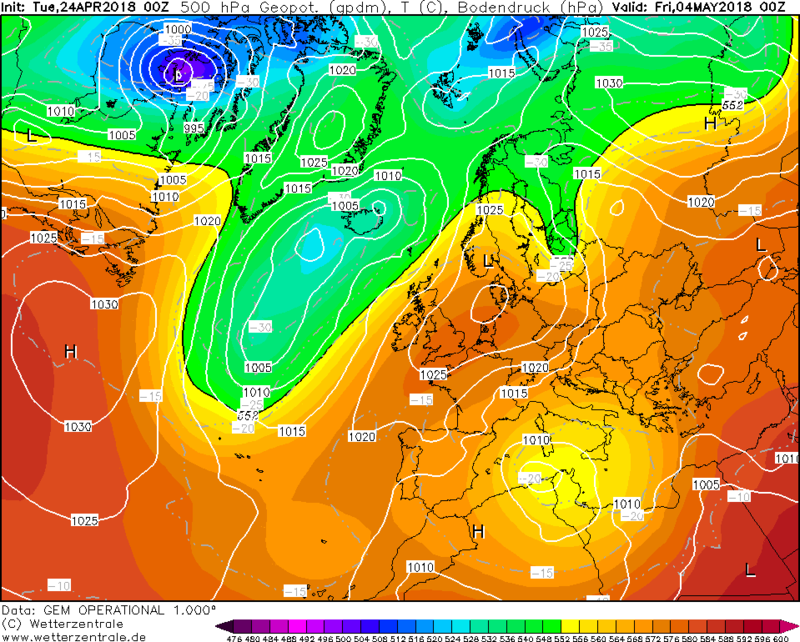 (Synoptically, it’s not quite the same as ECMWF with a flatter Jetstream riding over the top of the UK High Pressure. 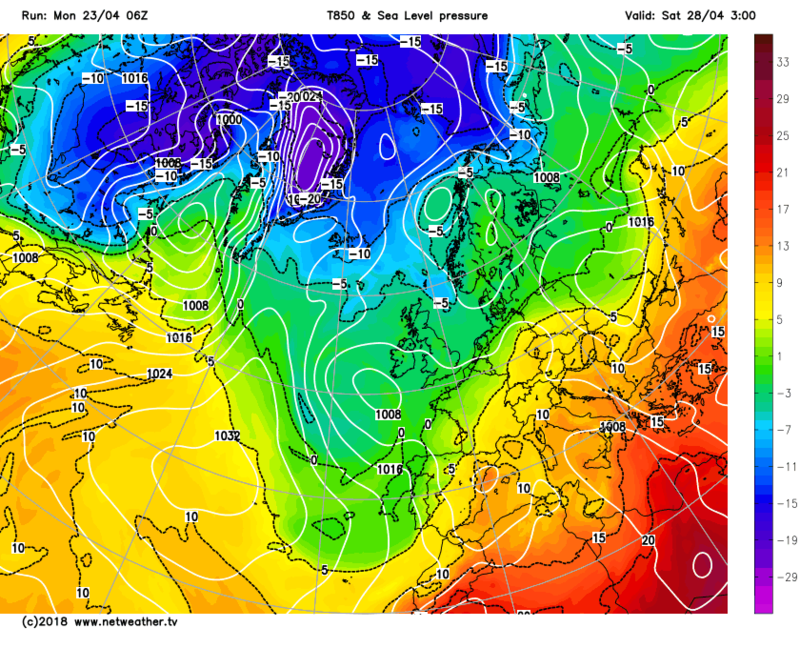 Though both models do show the weather over the U.K. settling down). Last week's exceptional spell of warmth is already fading into memory. Much cooler and cloudier in London this morning after five days in the 20s and a couple above 25c. The problem is in a year with an SSW and a moribund Atlantic the extremes of warm and cool which are usually tempered by the Atlantic and the average westerlies, are able to come forward with air flows from the SE or indeed NE more common with the resulting contrast in temperature between air masses. In the end, a decent chart with a long ridge of HP from the Azores covering most of the British Isles bringing increasingly settled conditions but the journey to this chart isn't pleasant with plenty of LP close to or over the British Isles in the next week. Not too far removed from the ECM though with a deeper Atlantic LP and a more displaced Azores HP but still a ridge over the British Isles allowing things to dry out after what looks a very unsettled and wet weekend ahead with LP to the south of the British Isles moving north over England. 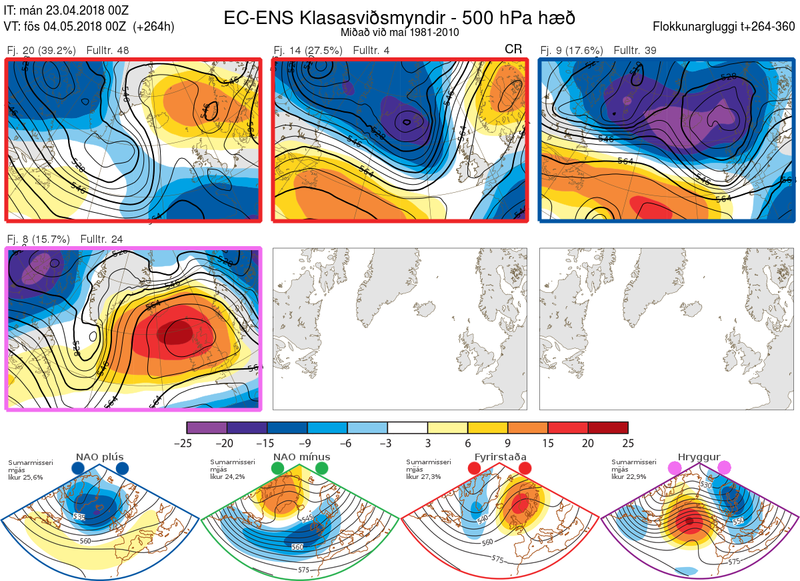 A very different evolution and it starts with the trough becoming negatively aligned rather than the positive alignment with GEM and ECM which allows the ridge to be thrown forward from the SW. With GFS the LP forms to the west of Iceland and swings SE to the west of the British Isles as HP builds in mid Atlantic behind it. At T+240 the LP is to the west of Ireland with a light SW'ly over much of the British Isles but rain or showers likely especially for western and south western areas. Further into FI, the trough elongates across southern parts before the core LP moves eastward then SE to northern France leaving most parts in an easterly flow with improving conditions for northern and north-western parts. On the Control, the ridge "beats" the trough so before the LP can slide SE, the Azores HP is ridged across the British Isles so a drier and warmer evolution with most areas beyond the far north dry. Further into FI and the large Azores HP remains in charge but its position and orientation doesn't allow for the advection of warm air from the south - instead, the flow is mainly west or north-west so settled but only average temperatures for most. A real mixed bag with as much spread as I've seen for several days but essentially we've two scenarios (or variations) in play. One brings the trough down over the British Isles with ridging to the NW behind it and the other gets the ridge over us first and keeps the LP systems to the north of the British Isles. Glancing further into May and the signal for heights to the north remains evident with the OP solution having more support than the Control at this time. 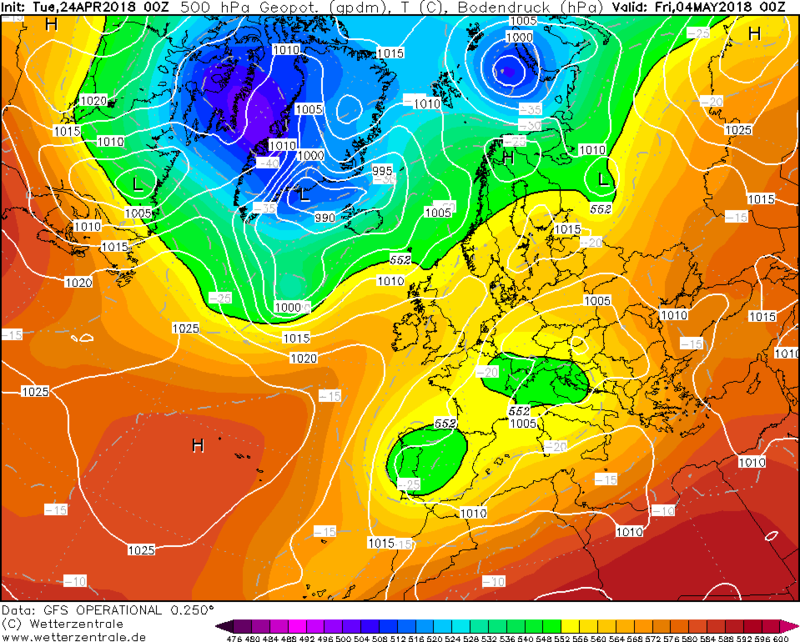 In summary, a much cooler and progressively more unsettled week ahead culminating in what looks a potential washout for southern parts over the coming weekend as the LP to the south develops and moves across southern Britain. From there, two scenarios come into place - GEM, ECM and GFS Control keep the LP to the north and bring a ridge back across the British isles from the south west but GFS OP has a more negatively tilted trough which comes SE with the mid-Atlantic ridge building behind and ushering in a period of renewed easterlies with LP setting up over Europe. I imagine many in here will want the former for obvious reasons but the latter isn't without support on the GFS suite and the signal for northern heights further into May remains strong as we move further into the new month. 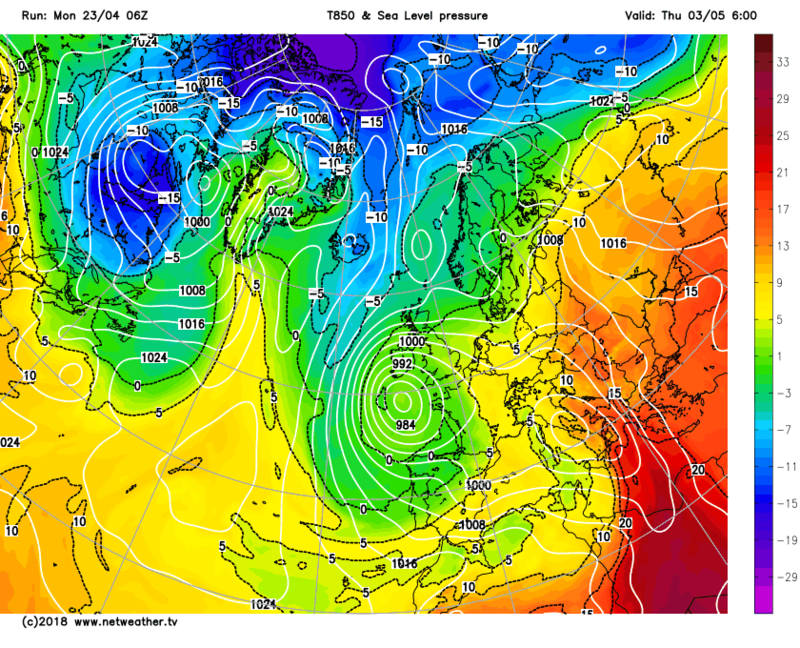 Looks like model divergence begins at the weekend and what happens to that low moving up from Iberia. As you say, Stodge, could be an absolute washout a la GFS, or if the low remains a slacker feature and stays in the Channel, we may get away with just a cloudy weekend. The GFS shows the low becoming unstuck over the UK and effectively rotating over us for a week after arrival, not warming out until the second week of the month. 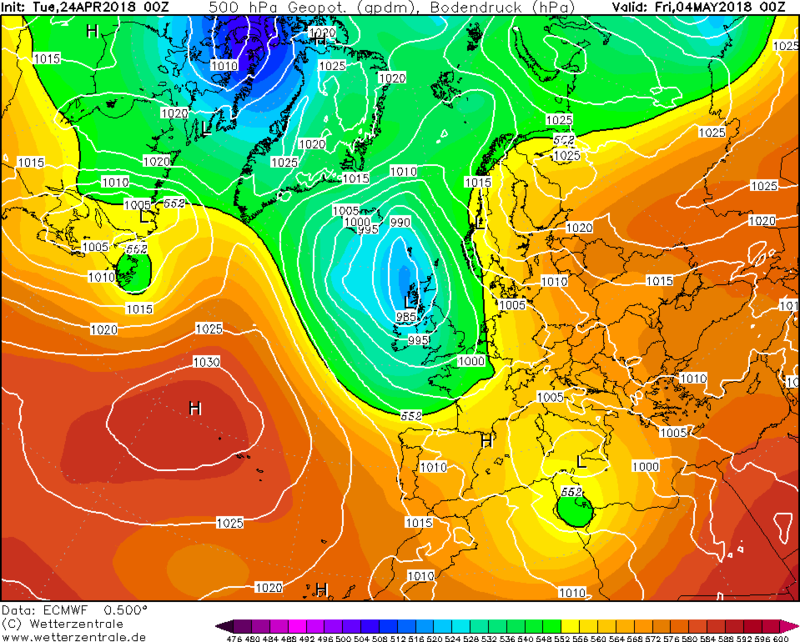 The ECM at least shows something more settled with the Azores high trying to move in into May. Personally hoping for at least a dry weekend with family visiting and outdoor things planned. Indeed GEM looks poor through next weekend and even into Monday but it gets the LP out of the way quickly to the NE leaving a col before the HP ridge builds in. ECM takes the LP just to the east so a poor second half of the weekend for southern and eastern parts before the LP shifts NE and the HP can build in so late Monday into Tuesday is the key moment. As for GFS 00Z OP, the LP doesn't clear away cleanly, part of the energy goes south, part hangs over the British Isles so the negatively aligned trough comes into the space and the HP is shut out. That's the pivotal point of the evolution but the GFS is following the pattern from later this week of having the trough drop through the British Isles from the NW and become absorbed in the LP to the south re-invigorating the LP and controlling the pattern through the weekend. Whether the GFS is simply seeing the repetition of the pattern while the other models are trying to break out of the pattern (by a default reset to an Atlantic-dominated westerly pattern) I don't know. The GFS OP is following what we saw a lot through the winter with negatively aligned troughs sliding SE rather than following the conventional west to east movement - a product of an amplified or weakened jet stream ? No ECM clusters so far this morning but a consistent theme over the past few days has been to keep Euro heights low as May begins. Probably (but not definitely) leading to a cooler than average start to the new month. Thanks SS - so broadly similar with a split between a NW trough and some sort of Euro trough - the extent and positioning of heights through the middle will determine the weather for the UK. Perhaps a chance of better weather towards the north and west? With warm air to draw on from the east. *if you're after heat, that is. ECM offered a glimmer of light this morning, this evening gone down like an ocean liner. Some very wet weather possible in next 7-10d maybe some thundery showers to break tedium, May tends to be a changeable month. Will be cool seems possible for there to be unusually low minima. Something for gardeners to be aware of. 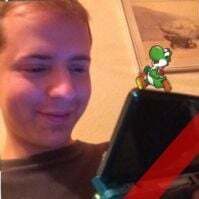 Looks like this is the next crunch point. The BBC extended outlook pushed the high pressure building idea last night....ECMM doesn't want to know this morning, the GEM much more favourable. Probably be a couple of days before we know how its going to play out.  Weather enthusiasts disappointed with lack of interesting weather on a Weather forum. Shock Horror. 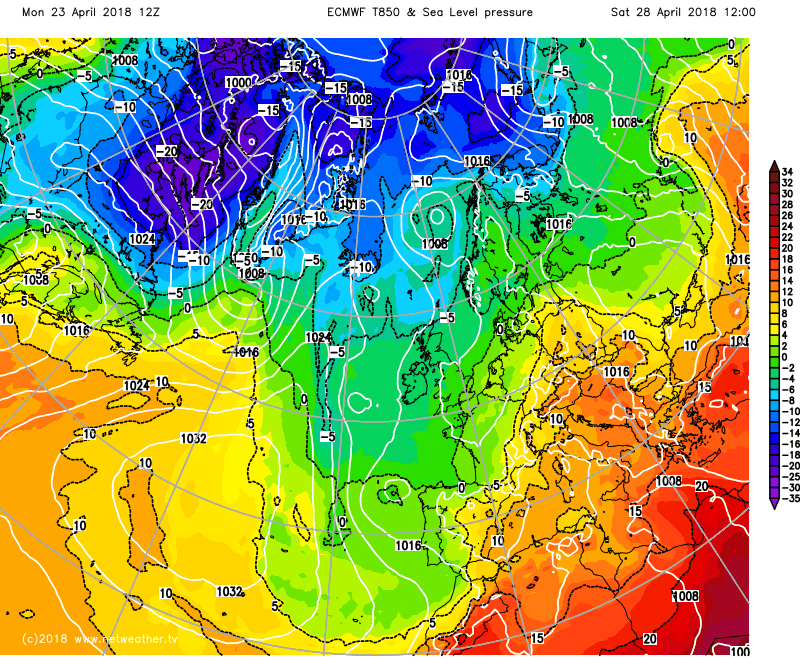 The post-early summer blues seem to have set in with a vengeance but it was always probable in a year like this with a moribund Atlantic and an SSW that we would be contrasts between the warmer and colder air masses and, to be blunt, it's still April. Snow in May on higher ground in Scotland isn't unusual and frosts even in the south far from a rarity. ECM this morning has backed away from its own 00Z solution of yesterday to the GFS solution from yesterday which has the LP moving SE from Iceland toward the British Isles. 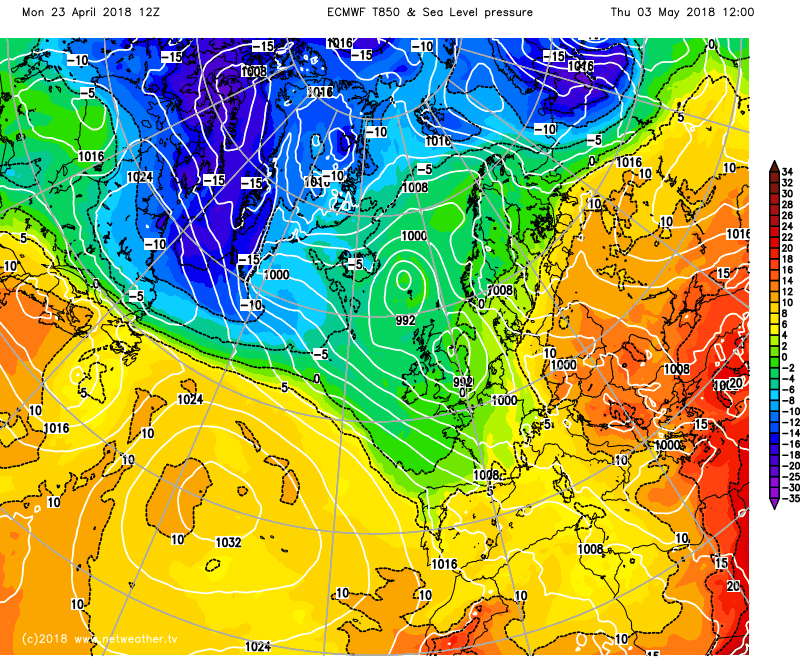 GFS had the LP passing to the west of Ireland but ECM looks like bringing the LP down over the British Isles so the promise of a poor first May Bank Holiday. The Azores HP is too far away to be of any value. Increasingly unsettled and cool conditions for most with rain or showers especially for northern and western parts. A completely different evolution and more in keeping with the GEM of yesterday morning. The trough coming from the NW is held at bay by a ridge from the Azores at the critical point of T+180. The LP fills in situ to the north and the next LP from the Atlantic comes on a positive alignment allowing heights to build from the SW and by T+240 we have a new HP centred over Denmark and the southern North Sea with a light ESE'ly flow bringing fair and warm weather for most with only the far north west of Scotland bothered by Atlantic drizzle. Better than yesterday which wouldn't be difficult. LP over central Europe but meandering east allowing the ridge to come up from the SW and link with emerging heights over Scandinavia so a decent outlook with a light NE'ly over the south cooling things down but fine for most. Further into FI it remains fairly settled with HP never far away from the south west so southern and western areas generally settled. Always a threat of rain for more northern and eastern parts - cooler too with occasional NW winds. A cool and showery (especially for the north) WSW'ly flow with a ridge to the south of the British Isles into Europe but LP close to Iceland. Control, like the OP, keeps the onus on more settled conditions with increasingly influential (and large) Azores HP extending the ridge NE so decent conditions for early May for many. Very different with a cool NE'ly over the British Isles and a deep LP over central Europe though what we have is NOT the LP that comes through the British Isles but a separate LP moving up from Africa which is invigorated over the Med and by our LP and becomes an active system for an inland depression. To this observer, the OP looks a little isolated but the Control looks more reasonable. It's a mixed bag and while some members bring in the ridge from the SW, the majority have LP close to or just to the south of the British Isles. In far FI, the 06Z GEFS keeps a strong signal for blocking from the NW or NE but as that so often fails to last into high-res I'd be very cautious at this time.